Curves and surfaces are a wonderful visual representation of mathematics. They can move from the simple and profound to the complex and intriguing. They have even been accused of being part of a sinister plot. In addition the mathematics behind them is becoming increasingly useful in many areas, algebraic statistics for example. I began this article with the idea that interest in the physical and visual sides of these objects was in a rather sharp decline. The curves and surfaces courses that I studied had rather few images, and beyond the Science Museum I had not seen a decent collection of mathematical models (and they have hidden a lot of theirs). However on scratching the surface of the subject I found a huge wealth of material. In fact so much that I have decided to split up my post (this one ended up at 1600 words anyway!). 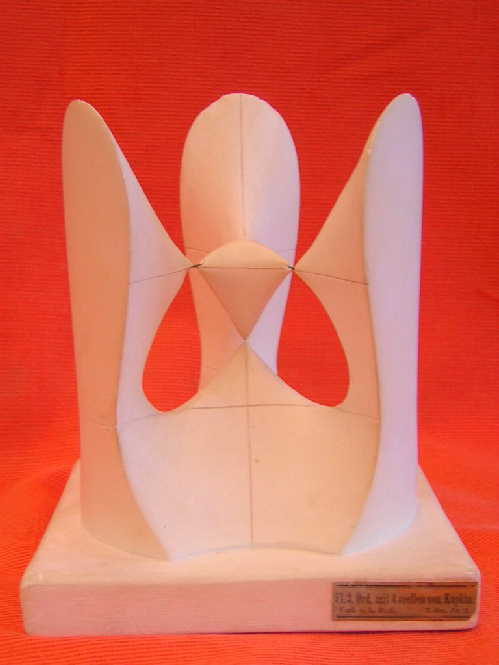 This first post will introduce mathematical surfaces and give some snapshots from their history and links to art. I plan two subsequent posts (this will be edited when they come online). Firstly an introduction to algebraic surfaces, secondly a discussion of splines and nurbs and how they provide a practical tool to designers (without them having to worry too much about the maths). So what is a surface from the point of view of mathematics? It is a two-dimensional topological manifold but this is just jargon. Start instead by thinking of a sheet that might be folded and draped. We normally want to consider surfaces that are smooth, which means that the sheet has no creases. However surfaces can get wilder in several ways. For example they can bend round and connect back to themselves. In fact we consider surfaces like this all the time. The surface (english meaning not mathematical) of any object you might pick up is like this. When the surface connects back onto itself and has no edges, it is compact. For example the surface of a ball is a surface, called, unsurprisingly, a sphere. Surfaces can also have holes. The simplest example being the torus which is the surface of a ring donut. The number of holes through a surface is called the genus and, for compact surfaces that we can create in three dimensions, the genus gives a complete topological description. Topology considers what happens when the surface is stretched and deformed but not glued or torn. This is the reason you will sometimes hear that a topologist cannot tell the difference between a donut and a coffee cup, as both have one hole. A second strange behaviour comes from the famous Möbius strip. To make this we take a strip of paper and put one twist in it. The two ends of the strip are then connected. This creates a surface with only one side, as by walking along the surface, without going over the edge we can get from one side to the other. The Möbius strip is not a compact surface, as it has an edge. However it can be made into a compact surface by attaching its boundary to the boundary of a disc. This gives a compact surface called the Klein bottle, that retains the property that it has only one side. However the property of being able to get from one side to the other is a topological one. We cannot create two sides simply by stretching and bending. How does this correspond to my statement above that the topological information is given by genus alone? The answer is that I cheated. I added the vague terms that we could make the surface in three dimensions. This is impossible for Klein bottle unless we allow the surface to cut through itself. Surfaces with this property are called non-orientable there is an analogous counting concept to genus for such surfaces, but it is a little more complicated. However genus and the distinction between orientable and non-orientable completely describe the topology of any compact smooth two dimensional surface. Topology is an interesting area that helps to understand some of the processes of modern mathematics. There are obvious differences between objects with the same topology (donuts and coffee cups), yet they do share certain features. Such features cannot be changed by a well defined (though large) set of operations. More importantly up to those operations we can understand all possible behaviour. We are therefore able to give a complete classification of surfaces. One of the origins of topology comes from the study of surfaces defined in a concrete way that yields a zoo of examples. These surfaces are called algebraic surfaces. Click the image above for a site with a wonderful zoo of examples. You can really find nearly anything you want for example to express your love. This zoo of examples is one of the reasons that mathematicians moved to topology to get an idea of the limits of what could happen. Even with a computer it is not trivial how to construct a model for any polynomial. However such programs do exist. You can find your own examples and generate models to play with in your 3d programs. However when mathematicians started considering such equations that did not have these luxuries. Things began in the seventeenth century with Descartes and the use of algebra and co-ordinates to study geometry. By the eighteenth century it had been established that many previously studied curves, such as the conic sections were in fact the solutions of polynomials. For example the parabola is the set of solutions of the equation and the double cone itself is the solutions of the equation . Many mathematicians, including Euler and Monge started studying surfaces in the same way, and also started to make models. By the middle of the nineteenth century model making had become and industry and there were catalogues of published models. In fact the Norwegian mathematician Sophus Lie received funding for many of his trips to France and Germany by the need to find models for the university, not for scientific collaboration. This proved a golden age for models however and by the 1930s they were dying out. The craftsmanship and accuracy of these models is mind-blowing. The act of creating a complex object simply from ideas, without having seen it before is hard enough when one is sketching graphs in two dimensions. Yet these craftsmen were able to achieve it in three dimensions. Even though today such models are no longer an essential part of any mathematics library there are still many places they can be enjoyed. Many universities still have (dusty) collections, as does the Science Museum in London (including polished wood models). Although it is not that satisfying to see a three dimensional model as an image there are also many places to see large collections online. The collection of the University of Groningen has a large number of Schilling models as well as several other. The University of Arizona and the University of Tokyo also have model collections online. The development of 3d printing allows for a far simpler method of constructing models, this site also has interesting details of the original process including the recipe for the modelling clay. Finally Angela Vierling-Claassen has a large amount of material and research on these models, including a photographic catalogue of the collection at MIT. At the beginning of my career I once classed myself amongst the photometrographers. My works are purely photometric. Take … the Shakespearean Equations, you will notice that no plastic idea entered these works, it is scientific thought which dominates. Although he always denied it Pevsner based his Developable Surfaces on a concept found in certain mathematical models. Finally how could I miss Maxwell Demon regular Max Bill. Bill of course considered mathematical ideas to be central to his work, and perhaps fundamental to the future of art. His work included consideration of surfaces, including the potentially independent discovery of the Möbius strip and Tripartite Unity, which also has a beautiful mathematical structure. very well done. i’ve posted a link at my new math blog.